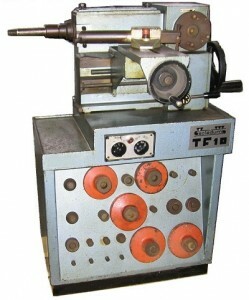 The Scledum TF10 Special is a dedicated brake disc and drum lathe with twin machining spindles; one dedicated to discs and the other to drums. Using the drum spindle, the machine has the capacity to reface motorcycle brake drums while still mounted to the wheel as well as accommodating large commercial brake drums. This is possible because our “Special” version of the machine utilises a stabilising outrigger on the drum machining spindle to cope with large weights. The disc spindle is specifically designed for the purpose of refacing brake discs and the machine has the capability to cut both sides of each disc on a single setting without removal from the machine or altering the set-up in any way. This eliminates errors that might be introduced when a similar operation is carried out on a conventional lathe which would require the disc to be removed, turned round and re-set before machining of the reverse side could take place.